Fans of “Crazy Taxi” look no farther because Meridian 4 is at it again with the wonderful bus driving simulation, “Bus Driver”. 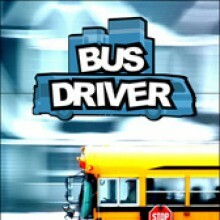 Who ever would’ve thought that a bus driving simulation video game would actually be this fun? I sure didn’t. I’m over the surprise now, but I was slightly addicted to this game for a brief period of time. This is the most realistic bus driving simulation on the market right now and if you think it sounds bad, you’re thinking the same thing I was prior to playing the game. Today I’m driving a bus and my next stop is “Bus Driver” by Meridian 4, so get on and find a seat because this is one bus trip you don’t want to miss! The first thing I noticed about this game is how stunning the visuals are. For a title that most people probably haven’t even heard of that’s published by a company of that same unknown status, I never expected such beautiful graphics. I’m not saying this is the best-looking game out there or that it’s even 100% true “next-gen”, but there was definitely a good amount of effort put into the visuals in “Bus Driver”. The roads are sharp, the buses look real and the environments look better than most games of this arcade-like style. This game doesn’t suffer from the “cardboard cut-out” style that many arcade games have and instead uses a semi-realistic, yet still unrealistic enough to be a video game approach. The worst-looking aspect of the game is the tree design, but even they don’t look bad; just slightly out of place. At the maximum settings, provided your computer is capable of running it smoothly, the framerate is solid and everything down to the customers looks great. The only real issue is that the people aren’t animated at all, so when you’re both dropping off and picking people up at the various stops on a route, the people just “disappear”. It’s a little odd, but it’s by far not a major complaint. If you enjoy music with your games, then sound is the weakest link of the game, but as this is a realistic bus driving simulation, it makes complete sense as it’s not common to have a radio playing or anything of the sort when you’re driving a bus. Aside from the catchy theme song, there’s virtually no sound track. There’s plenty of top-notch sound effects, however, that make up for this completely. Everything sounds great, even down to the most simple things, such as break sounds or the horn sounds. For a simulation game, the sound quality is great. “Bus Driver” plays like “Crazy Taxi” in some ways, but it’s too realistic and the rules are far too strict to be in the same league. When you load the game, a little box pops up that gives you access to basic configuration options, an “exit” button and the ability to launch the game itself. After you’ve configured your options and launch the game, you’re forced to watch all of the screens until the main menu shows up. The theme song definitely helps to get you in the mood to play the game, but the UI is slightly off-beat and it may take some people a second to realize that you can not use the mouse in this game. Everything is keyboard-based and the joypad support is terrible, so you’re stuck with playing the game with a keyboard. Once you’ve entered your name and you get to the tier select portion of the UI, you’ll simply need to scroll down the list and pick a stage. Once all of the stages in tier 1 are completed, you may start playing the stages in tier 2. The game continues this pattern until all stages have been completed, which is good because it’s a very basic and easy-to-follow method of unlocking the stages and progressing through the game. Upon loading up the stage that you’ve chosen, you’re immediately in control of a bus. From there, no tutorial pops up explaining how to play the game and there’s very little guidance aside from a little “news ticker” style box at the top of the screen during play. That’s the game’s main and only real drawback, but once you’ve finally familiarized yourself with the controls, there’s not really any problems controlling the bus, although some of the turns can be a little annoying at times. So, once you’re ready, simply move forward, stop inside of the orange-colored box near the bus stop and open your doors. Once all passengers have boarded the bus, close your doors and get ready to start your bus route. Simply follow the road, stop at the next stop, open your doors, wait until all passengers have boarded, close your doors, move along, rinse and repeat. That’s all there is to it, but it’s much more difficult than it sounds. Controlling these buses is really, really hard because it’s so realistic. A bus isn’t exactly going to have the best acceleration or handling, after all. There’s no difficulty setting and the game is fairly difficult even during the very first level. It’s fun to play, but extremely difficult to master this game. Overall, let’s just say that Meridian 4 has done it again. They’ve taken a concept I never even dreamt of enjoying and turned it into a fun, even though frustratingly difficult video game. Hats off to you for that, Meridian 4! -Great graphics with a smooth framerate. -Bus physics are as real as you’ll find in a video game. -Difficulty curve gives the game plenty of length. -No way of adding music during game play. -No replay value once all stages have been cleared. Meridian 4’s “Bus Driver” is one of the most unique games I’ve played for a long time strictly because it’s a realistic bus driving simulation and on top of that, it’s actually fun. If you’re looking for a fresh gaming experience and you’re not afraid to try something new, I highly recommend this game. Anyone who’s not interested in putting any effort into learning how to play a game may want to look away and check out something else.